Mounting depth (post to post): 26"
Guaranteed Compatibility : Fits all IBM, HP, Dell and Sun servers. Cable Management : Top Roof features Four 5.5" x 2" cutouts for cable entry. Security / Restricting access : Lockable front door, rear door, side panels and top cover. 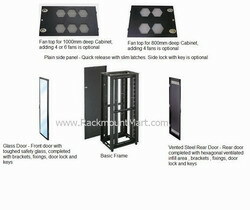 Safety : Heavy duty framework holds 1320lbs / 600Kg load rating. Unit Marking at Front and Rear. Rolls through a 7 foot Doorway. Maximum front to rear depth ( post to post depth ) : 26"